Gorin first discovered Amtgard in August of 2000 when he noticed a flyer at the local gaming store. He and his friend, Baraar, decided to stop by and make fun of all the D&D Larp Geeks. It was during this first meeting that he met Sir GoldCrest. It didn't take long for GoldCrest to convince him to give it a try and he's been hooked ever since. Since joining, he has held office a total of 17 times, serving as Monarch, Regent, Prime Minister, Champion and GMR, as well as 11 terms on the Board of Directors. Before he was elevated to Knighthood he served as a Page and then Squire to Sir GoldCrest. GoldCrest was Squire to Sirrah Elspeth, and Elspeth served as Squire to Sir Alaeric. 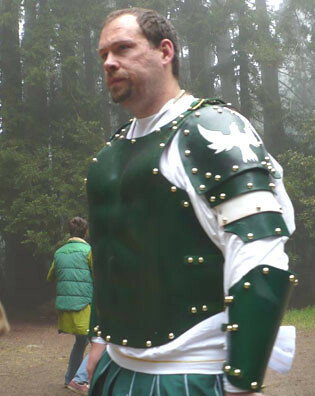 Knighted into the Knight of the Crown at Astral Winds' Summer Coronation of 2007. Granted Master Hydra on February 2009 at Astral Winds' Winter Coronation of 2009. Founder and Lead Instructor of The Astral Winds Grand Academy, a multi-day event devoted to teaching various aspects of the Arts and Sciences. He has so far held 5 of these annual events. Founder of The Astral Winds School of Novices, a program designed for players ages 9-13. This page was last modified on 28 November 2015, at 00:32.